"Thank you so much for such an informative and confidence boosting Course. I had previously done the NCT session but almost felt more panicked but this Course has given me the confidence I needed." "I think that the preparation session for couples is a brilliant idea!! 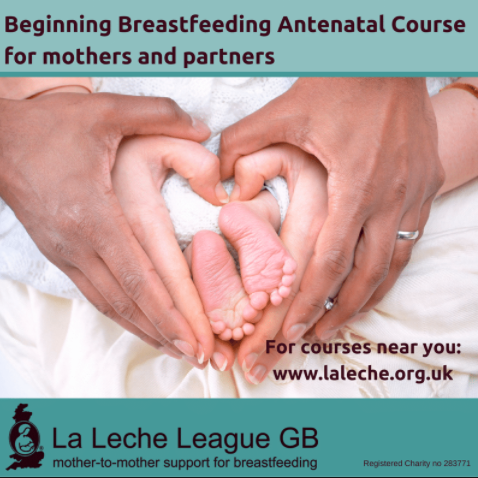 Claves and I found the course very well structured, father-to-be are not truly aware of all benefits (but also difficulties) when breastfeeding and to attend the course together helped us to have a better idea on how to plan breastfeeding. The course put us on the same line, where before we might have different ideas about the approach to follow. Places are limited so please book asap and we will operate a first come first serve booking approach. We believe a wonderful preparation to breastfeeding is attending our monthly Coffee mornings (every Tuesday 10.00-12.00). Many pregnant mothers have reported how much they have enjoyed these. You get to see lots of breastfeeding mothers in action and in a relax environment you can learn about the early days challenges and how mothers have overcome these.